UNLOCKED PROTRADER: Is Modern Masters 2015 Bottoming Out? I normally try to write some sort of opening that segues into my article in order to ease readers into dense material and establish my voice as a writer. I’m on a bunch of painkillers today, though, so we’re just going to jump in. 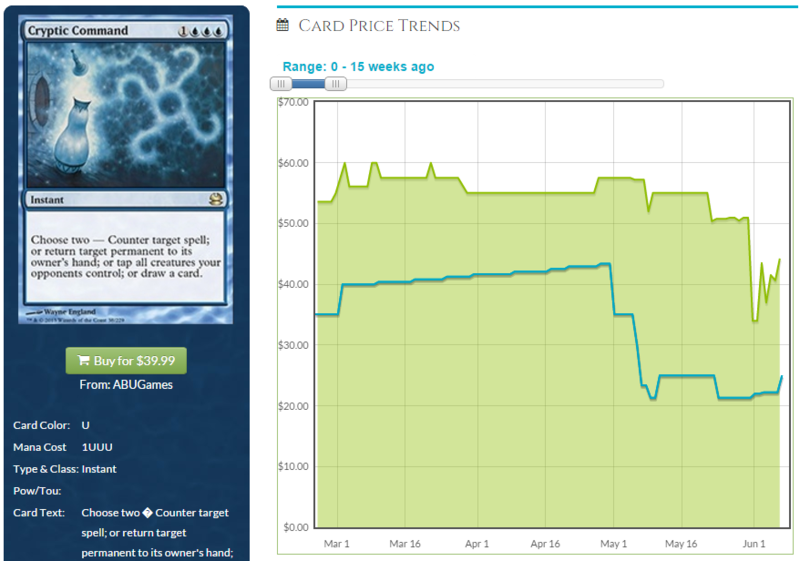 Two years ago, when the first Modern Masters released, prices drove off a cliff. On many price graphs of original editions, there’s a right angle heading south in mid to late May 2013. 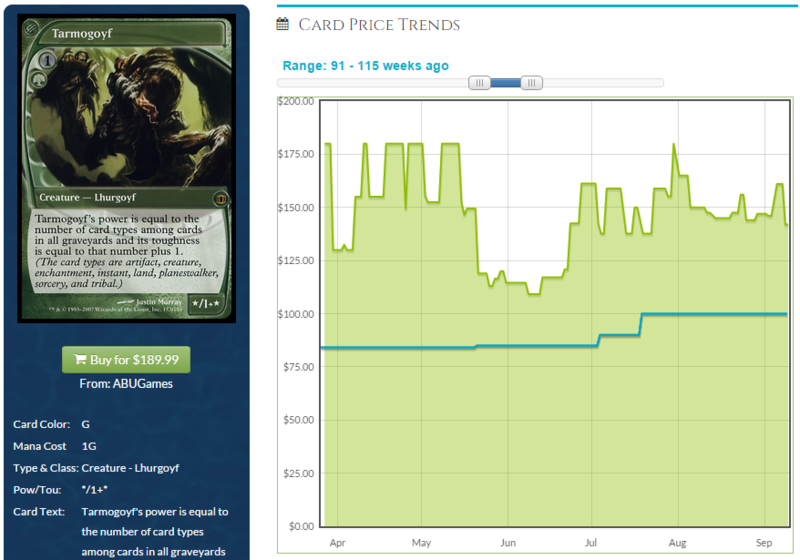 Future Sight copies of Tarmogoyf, which had been $170 to $180, were now in the $110 to $120 range. Cryptic Command dropped from $45 to $30. Vendilion Clique from $60 to $45 or or so. Wizards’ goal was to take a whack at staple prices without flattening them, and the set did a great job—in the first few weeks. It only took a month or two before prices on original printings began rebounding. Stores had trouble keeping boxes of MMA in stock at 30 percent above MSRP, which was driving prices up across the board. Lorwyn and Morningtide copies of Cryptic Command and Vendilion Clique didn’t wait long to begin regaining their lost value. Meanwhile, the MMA copies didn’t waste any time at all. They came out of the gate at prices reduced from the original printings, of course, but that would be the lowest they’d ever make it. Take a look at the MMA printings of the same two cards, Cryptic and Clique, from day zero. 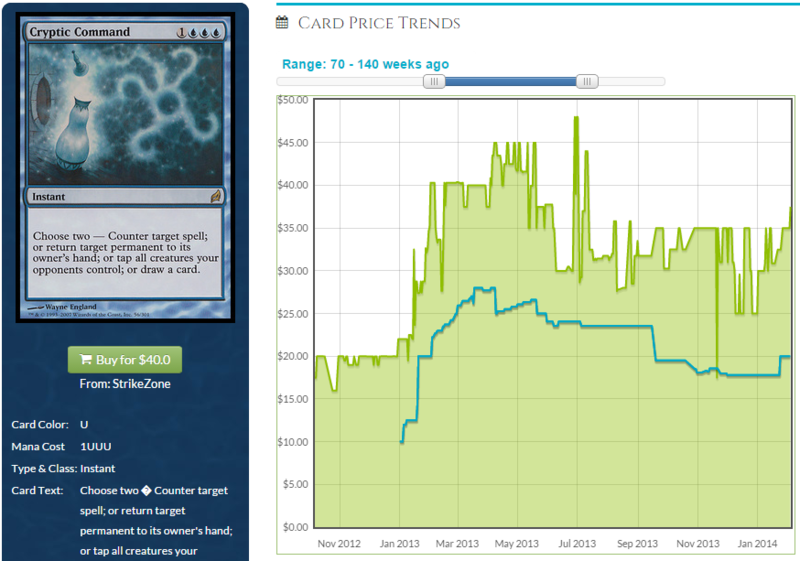 Both cards either stayed steady or rose immediately, at no point dropping below their initial prices. Overall, here’s what we saw during the first MMA release: Original printings dropped in value around launch, as was to be expected. After all, it was the first time many of these cards were seeing a second printing. Several weeks later, they began regaining their lost value, and about a year later, they were fully recovered, if not above where they had been before Modern Masters. MMA printings of the cards started out at the lowest price they’d ever be, climbed immediately, saw little or no meaningful loss in value, and eventually skyrocketed in the spring of 2014, when the set saw huge gains across the board. You got all that? Everything started low, gained value within a few weeks or even immediately, and never looked back. 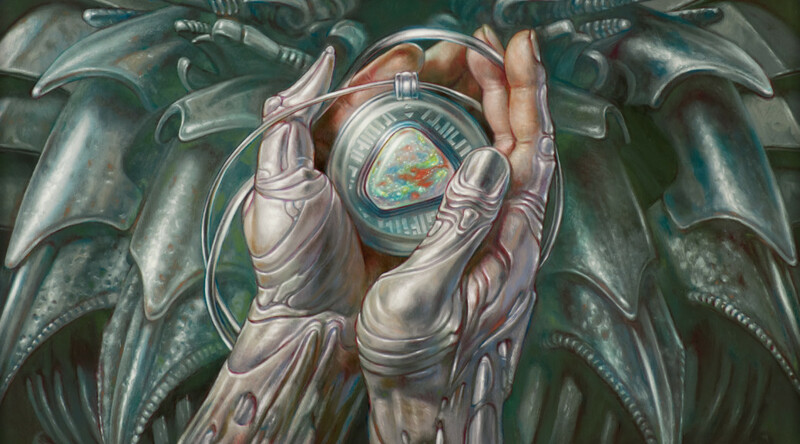 Let’s turn our attention now to the cards in Modern Masters 2015 that were also in the original Modern Masters. The major question on everyone’s mind is, “When will the set hit the floor?” The obvious implication is that when we find the floor, that’s the time to buy. I’m of the belief that we’re probably either there now, we’ve passed it already, or we’re within five to ten percent of it. While initially many of us were expecting to see considerably reduced prices on some of the rare staples, I don’t think we’re getting that low. Jason Alt and a few others, myself included, were discussing at one point getting in on Noble Hierarch at $14. I’m now about as confident as one can be in this field that we’re never getting that low, nor even close to it. Let’s take a look at the behavior of a few cards to see how things are shaping up. Keep in mind that we’re only a few weeks past the release date, so we don’t have boatloads of data to work with yet. We’re looking for small indicators that are going to tell us where things are headed. Don’t expect to see major upward movements on price graphs yet, because that would mean that we had already missed the floor. 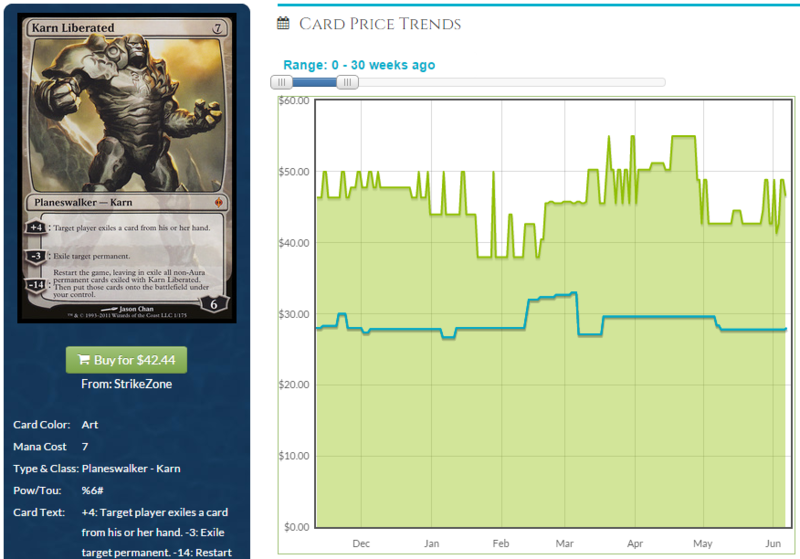 Here’s the MMA printing of Tarmogoyf in the last fifteen weeks. We see that the Fair Trade Price has drifted from $210 in the middle of December last year to between $180 and $190 today. That’s a loss of roughly 12 percent, and the price hasn’t started to turn up yet. Check out the buylist prices, though, which is the blue line. It’s at its lowest point early in May: $106. On June 6, just a few days ago, it was $110. We’re already seeing the buylist increase on the MMA copy, just a scant few weeks after the release of MM2. Buylist prices are often indicators of future retail pricing. They’re an excellent way of gauging true demand. How about the MMA copy of Vendilion Clique? We see a big drop in the Fair Trade Price in mid-April, from $75 to a low of about $58. A few days ago the price was already up to $60, and hasn’t been below that point yet. Meanwhile, the buylist price bottomed out at around $38, and has since climbed to $40. Cryptic Command has seen more noticeable changes. Prices in early March and April were in the $55 to $60 range. On June 1, we can see a sharp drop to $35 (although this may be the result of some funny data). The price quickly springs back up, and as of June 8, the Fair Trade Price is already $44, up considerably from June 1. The buylist line shows that there’s more to this than just retail prices behaving oddly. It cratered around May 10, but has already begun to see a good uptick at the end: from a low of $21 to $25 today. Is this the beginning of a rapid recovery for Cryptic Command? New Phyrexia’s Karn Liberated has perhaps the most impressive stats of any of these. In the last 30 weeks, his price has…not really changed. On November 11, his Fair Trade Price was $46.36. As of June 8, it’s $46.58. You can see the launch of MM2 between the May and June markers, with a drop in his trade price to $42, but by the time we hit late May, it’s already climbed back up. His buylist numbers remain consistent as well: $28 on November 10 and $28 today. What we’re seeing here is that Karn has barely been affected at all by the reprint. Let’s do another recap. Since MM2015’s release, the previous edition of staples (Tarmogoyf, Vendilion Clique, Cryptic Command, and Karn Liberated) have seen the loss in value we expect with a reprint, and have since either begun to level off or increase in price since their recent lows. What we may be seeing here—I can’t be certain—is that the floor of format staples has been reached. If the trends established with those four cards remain consistent, it means they’ve already bottomed out, and will be increasing in price as we move forward. How are the MM2 copies of some of these cards looking? 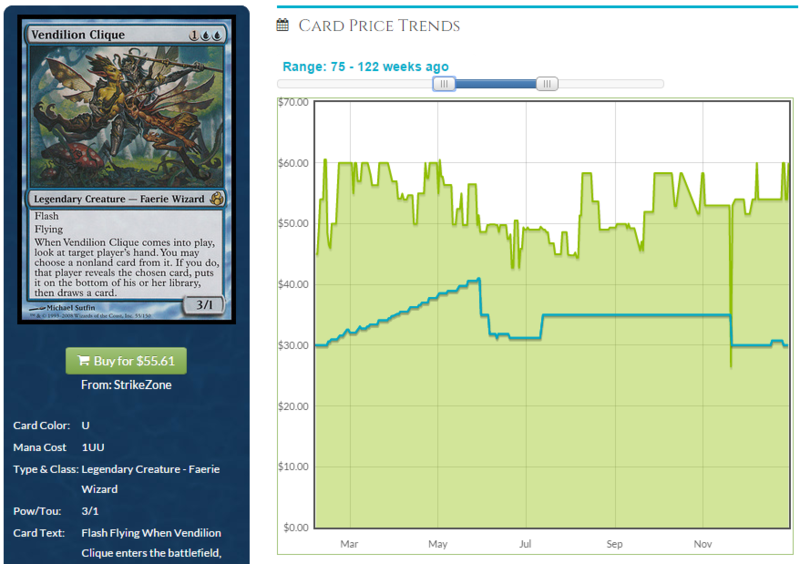 We’re seeing virtually no change in the MM2 edition of Tarmogoyf’s price. It starts at $165 on May 8 and is $160 as of this writing on June 8. That’s a three-percent loss in thirty days. It’s a loss, yes, but three percent is arguably negligible in a market as volatile as this. There’s certainly no indication that a major downturn is on the horizon. Hierarch has lost about seven percent since May 8. Notice that around May 23, the price is actually a bit lower than it is today. 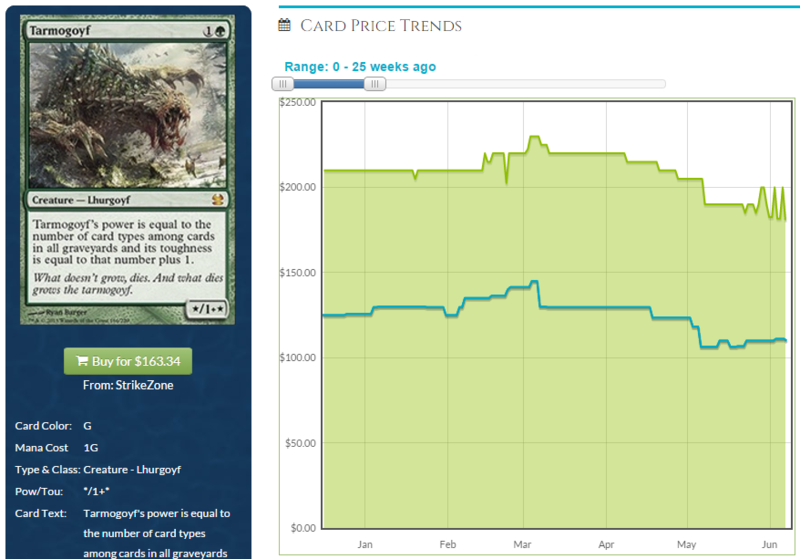 In fact, it’s visible in Tarmogoyf’s graph as well, although it’s a bit tougher to see. Is it possible that prices bottomed out on the 23rd, just a day after the Modern Masters 2015 official release? Fulminator Mage is funky compared to the others, and I’m not sure what to make of this data. It’s worth noting that it both starts and ends at $20 though. 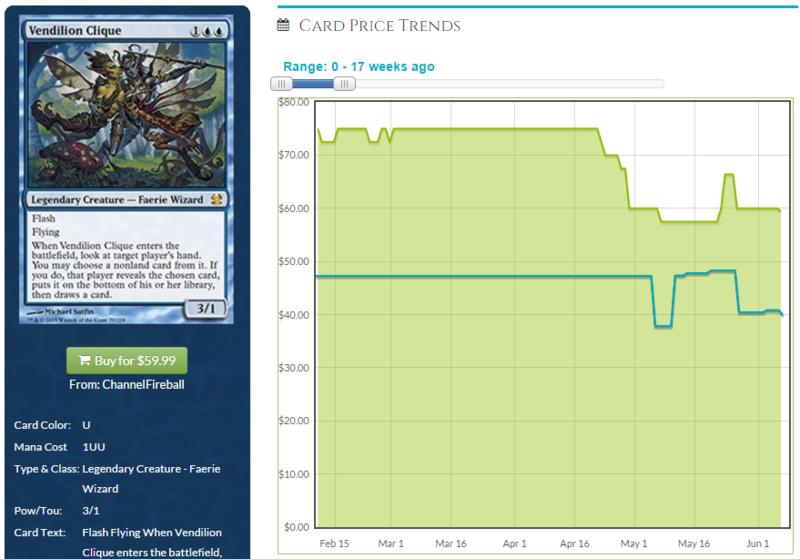 Vendilion Clique looks like Hierarch and Tarmogoyf: the lowest point on the graph is the 23rd, and today’s price is only a few percentage points away from the starting price. We see a pretty steady 20-percent loss from release. We know that after the printing of Modern Masters in 2013, across the board cards lost value. This wasn’t surprising. Then, while cards like Stonehewer Giant languished in bulk bins, and still do today, the true format staples bounced back quickly. 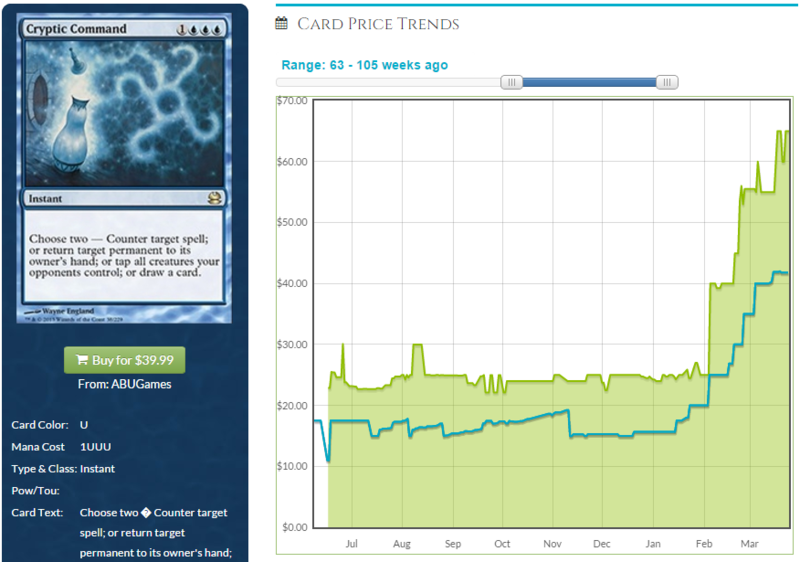 Meanwhile, the MMA copies of format staples such as Dark Confidant never got much lower than their price upon release. If we use these findings to guide our expectations, we see that the same trends are already emerging in Modern Masters 2015. Similar behavior is noticeable in two places. The most recent printings of cards in MM2 (MMA Tarmogoyf, NPH Karn Liberated, etc.) seem to have already stopped dropping, and in some places, may even be rising. 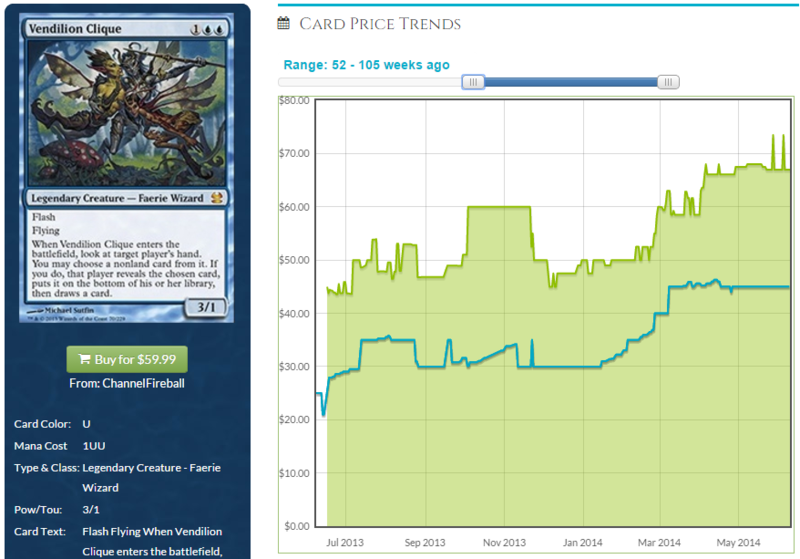 MM2 copies of high-demand cards, such as Noble Hierarch, have seen either no loss or negligible loss since release. Here’s where I am right now: I’m getting the impression that true format staples, the four-ofs, have just about found their floors. The other accessory rares and mythics that are powerful but that aren’t quite at the level of Tarmogoyf and Noble Hierarch are still suffering. Our takeaway is that now is probably the time to buy into the absolute cream of the crop, because if they aren’t at their floor, they’re damn close. If you buy Tarmogoyfs and Cryptic Commands now, there are two outcomes: either they aren’t cheaper again for another two years, meaning you couldn’t have done any better, or they drop from where they are today, but probably only a few percentage points, and you don’t have to feel bad at all. Why shouldn’t you feel bad if you didn’t buy at the absolute floor? At any time, any of these cards could spike hard. There aren’t as many new copies in the wild as people seem to think, and vendors have gotten a lot more aggressive with forcing the issue in the last few years. Maybe StarCity decides that Cryptic Command shouldn’t be less than $40, and just buys every copy on the market. Or Noble Hierarch. Or Mox Opal. Basically, if you buy now, you’re either getting in at rock-bottom prices or extremely close to them. If you wait, you only stand to save yourself a few bucks on what could easily be a $100 to $200+ purchase, and you also run the risk of getting blown out by sudden market movement. Consider Mox Opal. Copies are available for about $35 right now, down from $60+. How much cheaper do you really think it can go? Do you expect it to keep dropping and dropping down to $20? If it hasn’t happened already, when three GP’s worth of cards were just opened and 60%+ of MM2 stock that will be opened this year just hit the market, why would it suddenly occur weeks or moths from now? If I don’t have it listed (Leyline of Sanctity, Splinter Twin, etc. ), then I’m advocating staying away for now. These cards still seem to be on the decline. Is it possible they don’t level off, and instead just bounce straight back up? Sure. And if you are in desperate need of Splinter Twins, then you could do worse than locking in at today’s prices and being comfortable with that. If you can manage waiting, though, I would. The list above is also my MM2 trade list—I’ll be happy to pick up any extras of these. I don’t think you can go wrong trading for any of these cards at retail today, and I think we’ll see pleasant gains on all of them between now and the end of the year. Hopefully they won’t have skyrocketed by October and I’ll be able to shovel money into them ahead of February next year. It’s wild how fast the staples in Modern Masters 2015 seem to have leveled off. Initially we were thinking a month to three. Now it’s looking like half the chase cards in the set are on the rise and we aren’t even at Origins yet. We can probably stop using Chronicles as a reference point. This set is a good indicator of how to think about reprints in the future. If it’s a tier-one staple and we’re expecting reprints in a non-Standard legal product, then we have nothing to fear. Supplemental product reprints just don’t seem to move the needle much on competitive staples. Casual staples get hit hard, though, as we’ve seen time and time again. I’d warn against stockpiling too much money in any pricey casual specs. Kozilek, Butcher of Truth has lost 25 percent of his value so far, and I don’t think he’s done falling. That’s a big hit for such an awesome kitchen-table card. I would bet a card like Consecrated Sphinx would take an even larger hit, maybe a 50- to 75-percent loss if reprinted. Do you agree with me that we’ve found the floor? Are there cards you think we’re better off waiting on, or that we should be buying now? I think the EV being so much of a lottery is causing pack opening to be lower as people open that first pack bulk and don’t buy another. This leads to less product being opened relative to total supply and a slower drop in prices. As we continue to see boxes sell on sale for $185 and lower more supply will filter out. We are also at a peak competitive time for modern so the slower supply leak is exacerbated by an increase in demand. Prices will go down further yet I feel and we’re just awaiting a bit for the downward trend. Where are you finding boxes on sale for that price?? My LGS is going through boxes and packs without a problem at full retail value. It was Miniature Market’s deal of the day 4 days ago, got sent an email about it. Can’t imagine they’d offer that if the product was already flying off the shelves at their normal price of $210 which is still under MSRP.